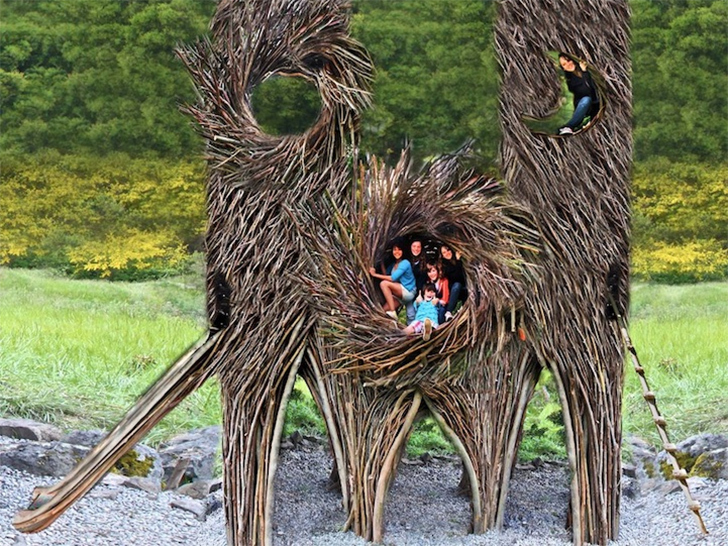 Jayson Fann builds giant spirit nests that are large enough to accommodate up to eight people. A California resident who helps to run the amazing Big Sur Spirit Garden along the Pacific Coast, Fann carefully harvests wood from local forests to build these amazing structures. Many days and hands are required to collect the requisite branches (without damaging trees), and many more to create the cozy, human-sized nests that are also structurally sound. Fann prefers to use Eucalyptus branches because they are strong, flexible and last longer than other branches. He harvests them by cutting them off healthy trees, careful not to cause any damage. Then, using a machete, Fann strips the leaves off the branches and scatters them to avoid creating any kind of fire hazard. These branches are collected over a period of 3-4 days with helpers, and then piled into a trailer that hauls them to the site. Creating a flowing organic form that is also structurally sound is one of the main challenges Fann faces when converting the branches into a human nest. He does this by bending the wood and using counter sunk screws, which are so hard to see that they don’t detract from the nests’ natural feel at all. Fann then builds a separate base that can withstand 2,000 pounds of wet wood and bodies! These are then lifted either by forklift or crane and then knitted together, after which Fann renders the interior comfortable with a woven mat and builds an access ladder. 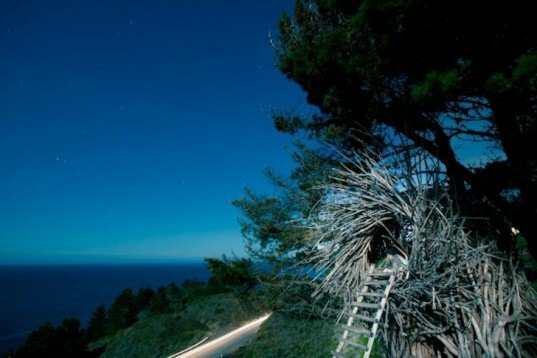 These nests have been installed in a variety of locations and support the Big Sur Spirit Garden’s numerous art and culture activities. Fann pays a lot of attention to creating an organic flowing form that is also structurally-sound.